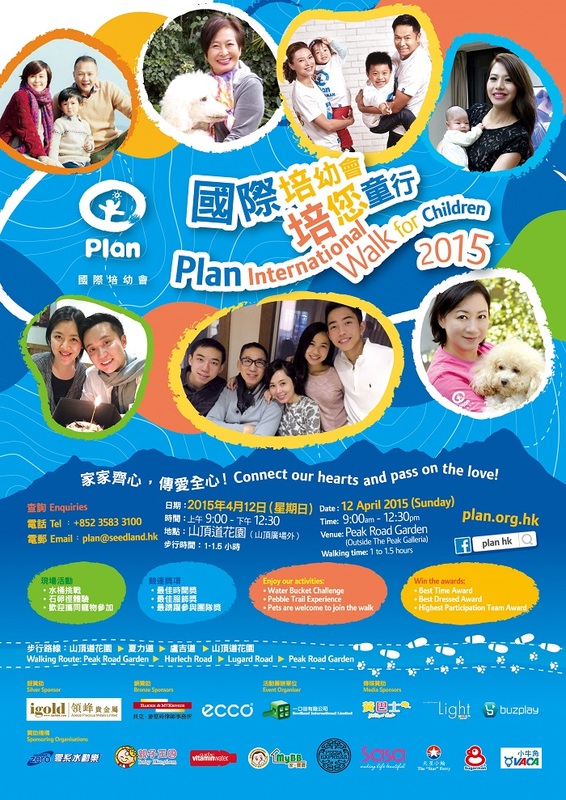 With the aim of lifting underprivileged children in remote regions out of poverty, the 4th “Walk for Children” will be held on 12th April at Peak Road Garden (outside The Peak Galleria) by Plan International Hong Kong. Thanks to the public’s philanthropy, the event has received fervent response since its announcement. Plan is now extending the enrolment deadline to Tuesday, 31st March 2015, encouraging more individuals to join the worthwhile activity. The funds raised from this year’s “Walk for Children” will benefit preschool pupils in Lai Chau, Vietnam and girls in Ghana, empowering them to rewrite their fates with the power of knowledge through the provision of quality education and practical training. To let participants experience the everyday challenges faced by the underprivileged children, various experiential activities such as “Water Bucket Challenge” and “Pebble Trail Experience” will be available during the event. In addition, participants are welcome to dress up in outfits related to the themes of “villagers” or “kids”, and compete for prizes like “Best Dressed Award”, “Best Time Award” and “Highest Participation Team”, making the charitable event more fun and meaningful. Meanwhile, Plan is currently running the first-ever “Pass on the Love to Our Children” Photo Competition as a prelude to the walkathon. Three rounds of contests will take place from today onwards on Plan Hong Kong’s official Facebook page. The public is invited to share the joyful, innocent smiles of children via the internet, while spreading the message of “Pass on the Love” in action. “Walk for Children” 2015 is now open for enrolment and the deadline has been extended to 31st March 2015. Participants are welcome to enjoy this special day along with their family and friends. Please visit the event website for more details, or call 3583 3100 for enrolment and enquiries. For more details on “Pass on the Love to Our Children” Photo Competition, please visit the Plan Hong Kong Facebook page.